ONE YEAR AGO, we asked you, our readers, to do two things: list the five most influential Christians of the twentieth century and then note five well-known Christians who were most personally influential. We posed the same two questions to historians who belong to the Conference on Faith and History, a group composed of mostly Christian historians who study Christianity’s influence in history. We've ranked each of the four lists by the percentage of votes received for each person. Here’s what we discovered. John Calvin (yes, the sixteenth-century reformer) garned two votes among readers as most personally influential. These are hyper-Calvinists, no doubt, who firmly believe in the resurrection. Radical demythologizer Rudolf Bultmann did make the top 20 list of most influential. It’s clear both readers and scholars believe you don’t have to admire a person to recognize how much trouble he may have caused the church this century. The only non-Western Christian to place significantly was China’s Watchman Nee. William Cameron Townsend, founder of Wycliffe Bible Translators (the largest Protestant mission agency in the world) didn’t even make the top 20 most influential lists. Same with Bob Pierce, founder of World Vision (the largest non-governmental social service agency in the world). Same with missiologist Donald McGavran, founder of the church growth movement. Responses from general readers (non-scholars) came in two forms, regular mail and e-mail, and we tabulated them separately to see if there might be some differences between the two. Three stood out. First, pop Christian singer Keith Green tied for eighth on the online readers’ most personally influential list (and Bill Gaither, Petra, and Stryper each earned a vote). Among regular mail respondents, Green tied for twenty-seventh. We surmise that the online readers are younger and have been nurtured more by contemporary Christian music. Second, Henry Morris, of the Institute of Creation Research, tied for nineteenth most personally influential among online respondents but was hardly noticed by regular mail readers. Third, among regular mail readers, positive thinker Norman Vincent Peale ranked thirteenth most personally influential, but with e-mail readers he tied for eighty-seventh. We’re guessing the snail mail crowd is older and actually read Peale in the fifties and sixties when he was popular. Herbert J. Taylor, businessman and philanthropist (and president of Rotary International who created its famous four-fold test) whose support (personal and financial) helped bring to life InterVarsity Christian Fellowship, Christian Service Brigade, and Young Life. He also sat on the boards of Fuller Theological Seminary and the National Association of Evangelicals. Henrietta Mears, founder of Forest Home Camp Grounds in southern California and Christian educator at Hollywood Presbyterian, who discipled thousands of future missionaries and Christian leaders, such as Bill Bright of Campus Crusade and Richard Halverson, former chaplain of the U.S. Senate. The main difference here between scholars and general readers is that James Dobson made the readers’ most influential list (instead of the scholars’ Reinhold Niebuhr). In fact, Dobson made three out of four of the lists in the survey. For both readers and scholars, Billy Graham was clearly the most influential Christian of the twentieth century, with a solid lead over the pack. In light of our criteria, the two surprises here were Reinhold Niebuhr and Francis Schaeffer. Niebuhr was a neo-orthodox theologian who has had tremendous influence to be sure, but our take is that it was mainly limited to America and among scholars (especially in history and public policy) and members of mainline denominations. Francis Schaeffer made a deep impact on a generation of evangelical readers who came of age in the 1960s and 1970s, but it’s hard to see his influence outside this sub-group. 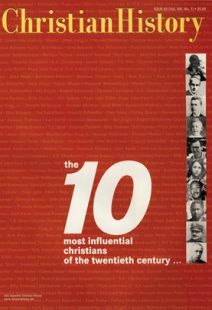 Bonhoeffer was one of six (with Graham, Lewis, Mother Teresa, King, and Schaeffer) who made the top ten in all four lists. The fact that two of the top three here are apologists suggests that our readers, not just our scholars, value the life of the mind. But they also value the spiritual and the practical. This is the only one of our lists that devotional writer Oswald Chambers (his classic book is My Utmost for His Highest) and Campus Crusade founder Bill Bright made. It is interesting to note that though popes John XXIII and John Paul II make the most influential lists of both scholars and readers, neither scholars nor readers have found them as personally influential. It’s no surprise that among intellectuals, apologists Lewis and Schaeffer top the list, and that keen thinkers like John Stott, Carl Henry, and J. Gresham Machen made the top ten. As historians, they've been especially influenced by George Marsden (premier historian of fundamentalism and evangelicalism) and Martin Marty (premier historian of religion in America). Reinhold Niebuhr’s Moral Man and Immoral Society and The Irony of American History have been seminal influences in the field of history, secular or Christian. That James Dobson made the top ten here is the biggest surprise. Most academics we know consider him simplistic and too politically conservative for their tastes. Does the fact that Billy Graham ranks as high as third suggest that perhaps he played a role in these historians conversions?